The composite photo above is from the Philadephia Inquirer online article Caregiver in death sent to prison which reports that caregiver Stacey Strauss was sentenced to two to five years in state prison, six months short of the maximum, after pleading guilty to a misdemeanor charge of involuntary manslaughter in the death of Bryan Nevins who she left in a hot van unattended where he literally baked to death. Strauss is pictured in the bottom left hand corner and Bryan Nevins is in the top right. 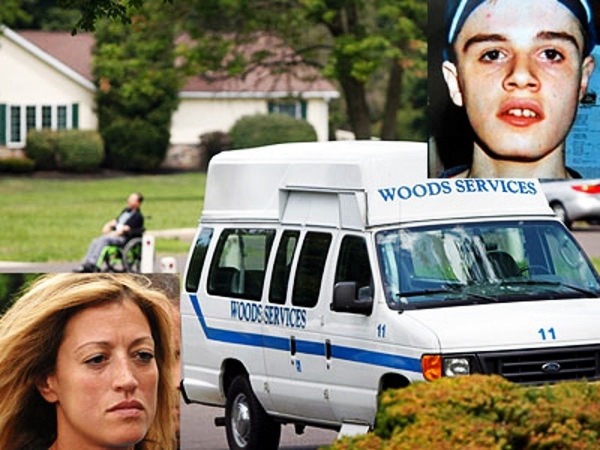 On July 24, one of the hottest days of the summer, Strauss had left 20-year-old Bryan Nevins in a closed van at Woods Services in Middletown, where Nevins lived and Strauss worked as a residential counselor. He was found more than five hours later, dead of hyperthermia. The tragedy happened after Strauss and a coworker had returned from a trip to nearby Sesame Place. Nevins, who functioned at the level of a 2-year-old, was unable to get out of the van on his own. Competing for Strauss' attention was the apparent allure of her cell phone. Records showed that she talked on the phone for more than three hours of her eight-hour shift, and made or received 71 text messages, all in violation of Woods Services regulations. Among the calls was a 44-minute chat with her boyfriend during the time Nevins is believed to have died inside the van. "During that phone call, if the defendant had gone to Bryan, his life would have been saved," Deputy District Attorney Robert James told Cepparulo. Instead, James said, "Bryan literally baked in that vehicle while she was on the cell phone with her boyfriend." My 15 year old son has autistic disorder with profound developmental delays, he is severely autistic. This story makes my stomach turn. It scares the hell out of me to think that someone like Stacey Strauss could be left with the life and death responsibility of caring for someone like my son. I am happy that she is going to a state prison. But institutions and facilities everywhere in the US, Canada and elsewhere must be subjected to greater surveillance and review to ensure that what happened to Bryan Nevins does not happen to anyone else. Amen on that, and I hope she doesn't get any "phone privileges" while in prison. I was a Home Health Aide for 16 years, and was always on the lookout for unsafe conditions. They hired her, and they hire the other workers responsible for abuse, neglect, and, yes, several deaths. Woods is getting big bucks working with students New York City (and State) sends them. Pennsylvania, every time I contacted them (with phot evidence, doctors reports, etc) responded that complaints were unfounded. As my old law profs used to say, follow the money. Money really is the root of all evil where spec needs are concerned: it was more important to the Long Island agency to get film of abuse, so the AGENCY wouldn't have to defend against wrongful discharge of the worker, than to take immediate action to defend the resident. There may not be true justice in this world, but there will be a day when there is justice before GOD for even a tiny little slap. SO sick at her lack of remorse. Digusting. I am horrified at the fact that he was left in the van and for so long. I am saddened though at the fact she was made the scapegoat. She does deserve everything that she got but however she is not the only one to blame. Woods Services had a major breakdown in communication and just plain commonsense. How can a person like this be let to be a caregiver ? How can a person be so irresponsible? I hope she suffers like him... only longer and harder.